One thing I didn’t do was ask the players in the group to “improvise twelve tone style.” I think improvisation is about freedom in context so I wouldn’t presume to tell them how to play, I would only create the context in which it could happen. Too much theory can be deadening. But in my own playing I found the theory useful as a launching pad for escaping the hegemony of the tonic. I love the way DD is able to express himself in words as it relates to his music. “Too much theory can be deadening.” I like that concept, especially if you follow it through to the idea that “too much” can be a different amount for each musician. What is too much for me, might not be even close to enough for some of my saxophonist friends. Find your own balance. Another nice eMusic surprise, Liberty Ellman’s Ophiuchus Butterfly. I am especially digging the texture with the tuba, both with, and without, and complimentary to the bass. Jose Davila on tuba…very cool. Why not beauty? And by the same token, why not ugliness, … Everything is part of the human experience. I have a few Ben Allison albums that I like, so when I saw Cowboy Justice on eMusic, it was a no-brainer to click the download button. I’ve given this a couple of listens, and I am really digging it. The compositions are good, and the grooves feel great, but the one thing that has really grabbed me on this album is the playing of trumpeter Ron Horton. I have heard his name before, but to my knowledge I hadn’t heard him play. I’m glad I am getting to hear him on this album. He sounds great. This is a fun look at the musical sensibilities of children and how they might be formed. 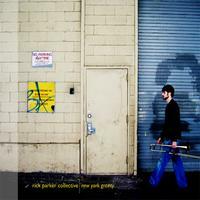 I just picked up two CDs from the Rick Parker Collective. Finding Space is the newer of the two CDs. Both feature good compositions in the modern New York style: interesting harmonies, nice grooves, attention to the arrangements. Listening to them side by side is an interesting experience, because you can hear several years of evolution. New York Gravity was recorded within the first year after Rick moved to NY and you can hear that fresh young energy in it. I hear that energy change on the later CD. I don’t want to say it turns cynical, but it definitely changes. Of course that could all be projected by me. That’s what I get for reading the liner notes. You might hear it differently, and I am sure it was meant differently by the artists, but that’s some of what I hear between the two discs. Both discs are good. Check them out. In this performance review,Darcy James Argue’s Secret Society: Steve Reich @ The Whitney, 15 Oct 2006 (Alarm Will Sound, So Percussion, etc), Darcy exhibits how deeply he gets it. …at the time Reich first started presenting his music, few classically trained players were capable of dealing with its demands. It’s not that the music is flashy and virtuosic — just the opposite. But it requires (and I’m sorry to keep harping on this, but it’s important) rhythmic authority. Rhythmic authority isn’t just the ability to play rhythms precisely, although unfortunately, many classical players aren’t even equipped for that. Reich’s music is only playable if everyone has a rock-solid internal click track going, as well as the ability to both lock in with the ensemble and — when necessary — slip off the grid while still maintaining rigorous control over your own tempo. And that’s just to get through the music on a basic level. For the pieces to come alive, for the music to draw the listeners in instead of just sitting there, flat and sterile, you need to have an emotional connection to rhythm. You need to understand viscerally, in your gut, what a short note on the “and” of one means, and how it’s different from the same note in a different part of the bar. You need to have an intuitive sense of how tiny differences in emphasis and placement can drastically affect the character of a syncopated or repeated figure. In other words, you must be able to groove. …the major record labels by and large insist their music must have some sort of DRM protection before they’ll license it for digital distribution. Increasingly, the wisdom of this stance is coming under scrutiny. Finally, people are starting to realize this. DRM, they say, simply forces consumers to buy hardware with proprietary technology that enriches software companies rather than artists or labels. The conversation has heated up now that Microsoft is preparing to enter the race with another closed system as part of its Zune strategy. Once Zune is launched, there will be two large, deep-pocketed digital services offering music that is not only incompatible with each other, but also with the many other digital music devices and services already in existence. Shouldn’t we as consumers insist that the companies we do business with give us what we want? That is so deep, on so many levels. Ornette told me about studying some scores of European music like Beethoven. He thought it was pretty good, but could hardly believe that the players in the orchestra couldn’t change their notes to go with they way they felt. Suppose Ornette could perform Skies of America again with an orchestra of talented creative players willing to take some harmolodic initiative? Would some rain forest be saved or something? I’ve often wondered if the vibrations created by good music can really make the world a better place, even if only a few people hear those vibrations. I’m glad to know I’m not alone in those thoughts.